Barcelona were stunned at the Parc des Princes on Tuesday night in what must go down as one of their worst performances in the Champions League in recent memory. It started to go wrong for the visitors from the off, with PSG dominating the early exchanges. They made that strong start pay, too, opening the scoring with a gorgeous free-kick from Angel Di Maria. 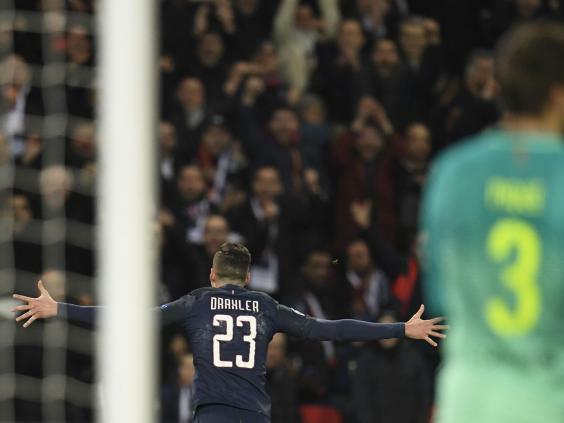 Bouyed by an electric atmosphere in the French capital, PSG doubled their lead through the excellent Julian Draxler and were unlucky not to be three or four up at half-time. But they made amends in the second-half, scoring their third through another brilliant goal from Di Maria and then a fourth from birthday boy Edinson Cavani. 1. Is this the end of an era for Barcelona? Such a defeat rarely happens to Barcelona, and with their Champions League hopes all but extinguished bar a record fightback in the second leg, this could prove to be the beginning of the end for their dominance of European football. 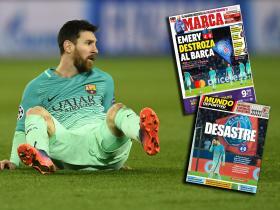 The loss has already triggered serious questions over Luis Enrique’s future as manager, with Barcelona’s league form failing to help his case either given that the Catalans could be seven points behind leaders Real Madrid once they play their two games in hand. But it could also be the catalyst for Lionel Messi to leave the club. The 29-year-old is beginning to run out of time to prove himself in another league, and with Barcelona’s dominance evidently over, could he decide that the summer is perfect timing for a new challenge? After resting players at the weekend in the win over Alaves, Luis Enrique did what we all expected and went with what the Spaniards refer to as his ‘gala XI’. The much-vaunted MSN frontline started, supported by what might now be his first-choice midfield. Andre Gomes was in for Ivan Rakitic, whose poor form this season won’t see him miss out on a new deal but has seen him surpassed by the £45million purchase from Valencia. Enrique’s faith in the Portuguese wasn’t repaid however, with PSG utterly dominating in midfield. Adrien Rabiot, Blaise Matuidi and Marco Verratti found time and space and were allowed to unleash Julian Draxler and Angel Di Maria out wide. Gomes was taken off after an hour. 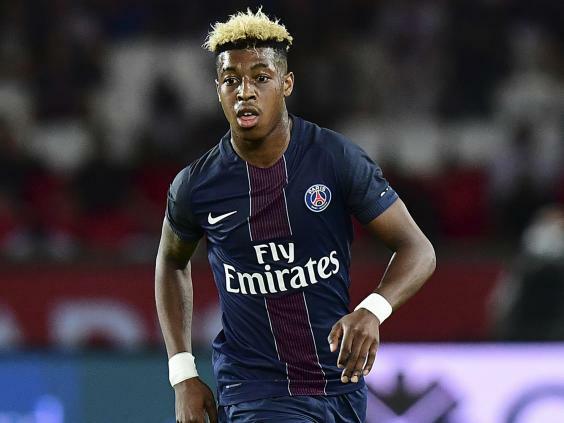 Following Thiago Silva’s pre-match injury, coach Unai Emery was forced to put his faith in youngster Presnel Kimpembe at centre-half. The 21-year-old has started 15 games for PSG this season but this was his first start in the Champions League, and he had the small matter of Lionel Messi, Luis Suarez and Neymar to deal with on his debut. But deal with it he did. While Barca’s front three were clearly under par, the French youngster looked assured at the back alongside the more experienced Marquinhos, and even had the temerity to bully Messi off the ball on the hour mark. 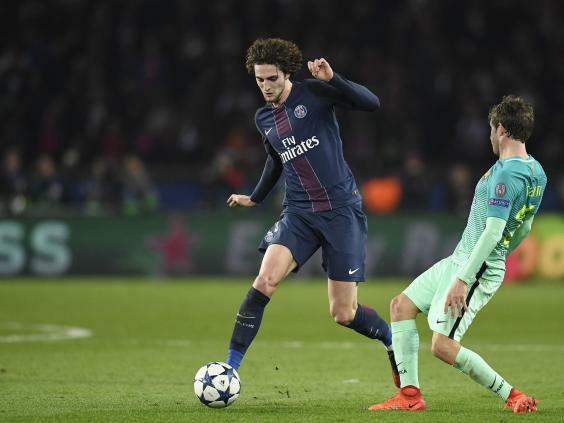 PSG clearly targeted Barca’s right-flank early on and Julian Draxler gave Sergi Roberto a torrid time, beating him far too easily and creating several chances for the hosts. While Dani Alves was hardly the world’s most accomplished full-back in the traditional sense, he more than made up for it by using attack as his best form of defence. Barca let the Brazilian leave last summer after eight years at the club, and judging by Sergi’s performance on this big Champions League night, they may well be ruing that decision. Sergi Roberto’s failings should take nothing away from Julian Draxler, whose performance – capped with a goal – was excellent on the night. The German winger was long linked with a move away from the Bundesliga and PSG must be delighted they were the ones to secure his signature. The 23-year-old has now scored five goals in his first nine games for the club and looks a bargain at £34m. Keeping him quiet in the second leg will be crucial if Barcelona have any hope of getting back into this tie. Niggly fouls, a cynical early challenge to let his opponent know he’s around and constant recycling of the ball. Those may all be attributes of Sergio Busquets at his best, but the man performing them with aplomb on Tuesday night was PSG midfielder Adrien Rabiot. He did little flashy, but the 21-year-old was the foundation with which PSG built their attacks, offering protection in midfield and allowing teammates like Di Maria and Draxler to do the damage.